It was great working on the AIHA project, really a fantastic opportunity. But there were some frustrations and disappointments — foreign aid could accomplish so much if only it weren't so messed up at times. Bring all your hope to nought. Sloth and heathen folly can bring all hope to nought, although sometimes it's imported along with the aid. The sloth and folly often take the form of "We're from the US government and we're here to help." This is then added to the locally produced sloth and folly. It can be difficult to decide which is the more pure and refined sloth and folly in the resulting mixture. An example is the AIHA big-wig I encountered. She was the AIHA chief of operations for the country. At least for all of Russia, and it may have been for all of the former Soviet Union. She had been in Russia for between six and twelve months when she traveled up to Sankt-Peterburg to visit our project. It was one of the most productive AIHA partnerships, and she came to see why that was so. Who do you use as a buyer? A "buyer"? What do you mean? If you have to purchase something, who do you have to do that for you? No, no, I mean when you need to get some bottled water, or maybe you just want a candy bar or something. Who do you have to buy that for you? Oh, there are kiosks all along the street. They have all sorts of drinks and snacks. And there's a supermarket a few blocks away. Yes, so who do you have as a buyer to make those purchases for you? From the kiosk? We just go out there and buy things. Yes, it's no big deal, you just go out there and buy whatever you want. Well, how do you communicate with them? Do they speak English? No, not that I know of, but it's not really a problem. You point at what you want, and you know approximately what it's going to cost, and they make change or ask for more money. But what if it's something more difficult? IT SURE IS NICE OF YOU TO HELP THEM LIKE THAT! Uh, thanks. It's no problem, really. YOUR ENGLISH IS VERY GOOD! OH! Oh... But then how do you communicate with the people here? Yes.... Everyone around here seems to speak it. But how do you know Russian?! I took some classes at college. Eventually we learned that the chief of operations for the country had been there for over six months, but she had never directly interacted with any of the locals other than a few who were native-fluent in English and worked directly for AIHA. Everything was done in a bubble, like a Kipling-era colonial mindset. Well, no, not like that, because Kipling's stories accurately described how many of the British interacted directly with locals. The reason I got invited back on multiple trips was because I could speak some Russian. And beyond the practicality of being able to get around on my own, you can't study a language without learning about the people who speak it. Their culture, and just the way that things are done there. Some were Russian things, others were leftovers of the Soviet system, but there were a lot of times I could say, "I know this may sound strange, but look, here's what's really going on here. They do it this way because ...." It seems like that would be useful knowledge for the people sent to administer a program. The partnership I worked with accomplished things. Some of the other partnerships seemed to be boondoggles used by US hospital executives to get trips to Russia to experience the museums, ballet, and classical music. Their sloth and folly tended to get shut off after a year or two. So even though AIHA could be pretty clueless, at least they had could tell what worked and what didn't. And then there's how, even though the "I" in AIHA stands for "International", they didn't seem to know anything about traveling overseas. They routinely set up Russian visas that expired at midnight on the day your flight was to leave. Any change to your itenerary required painful changes to keep your papers in order. All they had to do was ask for the full length available, and you wouldn't have to worry about getting out of the country on a specific day. I had to get a visa extended one time — it took almost a full day at OVIR, the Russian visa office, to extend a visa by one day. AIHA also seemed rather ignorant about travel within Russia. Travel between Sankt-Peterburg and Moscow on the many overnight trains was, in their view, enormously expensive and difficult to set up. This was because they insisted that travel should be done only on trains with foreigner-only cars. Silly me, willing to ride Russian trains occupied by actual Russians in order to get around in Russia. Robert Rosenberg's novel This Is Not Civilization is pretty good. It's fiction, but it's obviously based on his work, first on a U.S. Indian reservation and then overseas. He colorfully describes the post-Soviet corruption and the futility of much foreign aid. So many aid workers are out of touch and unaware of it. And the would-be recipients are often puzzled by the purpose and mechanics of aid. They may be insulted by it, but at the same time they demand preposterous benefits. AIHA sent me off one day to visit the computer engineer at the Pavlov Medical School near the center of Sankt-Peterburg. I had no direction but to go and "check on him" and help him get things straightened out. It sounded like AIHA thought he needed either supervision or remedial help. I found him, and he was as puzzled as me about the purpose of my visit. Well, while I was there, he might as well show me his systems. "Here's my DNS and DHCP server, this is the external web server and this one is the internal web server. I use this one over here as the SMTP mail gateway." On and on like that. Other than the fact that the computers were sitting on tables instead of being in a rack, it was pretty much what you would find in the U.S.
We hung out and talked shop while waiting for my group to head back out to the edge of the city. I had come into the city with some U.S. medical personnel sent on a similarly pointless exercise of "checking on" the Russian medical staff. I asked my host how he had come to be so skilled with computers and networking — I was guessing that he had graduated from engineering school some time in the late 1960s to early 1970s and therefore before the days of TCP/IP, microcomputers, and so on. He laughed and said that he was a dermatologist. "You know, a doctor of the skin..."
Yes, yes, I know what a dermatologist is, but what was he doing as the school's computer engineer, and now I was really curious about how he had learned to do this! Well, at the time, a physician earned the equivalent of maybe US$ 30-40 a month. And Sankt-Peterburg was a fairly expensive place to live. And that US$ 30-40 was what one earned in theory. Many months you were paid less, or nothing at all, because the medical school (or hospital, or wherever) didn't have the money. An opportunity had come up through the AIHA/USAID program. There would soon be a computer engineer position, working with systems to be provided from the U.S., with a salary of US$ 55 a month to be paid from USAID funds and therefore guaranteed to be paid. So, he went downtown to Dom Knigi, the big bookstore on Nevskiy Prospekt, and bought a few books about computers, networking protocols, and network services. Books written in English, no less. He read them, figured it all out, and now he was the computer engineer. Oh, would I like to see what he had figured out about a better way to configure his DHCP server regarding the pool of dynamically assigned IP addresses? The only silly part of the story is AIHA thinking that someone needed to check up on him. 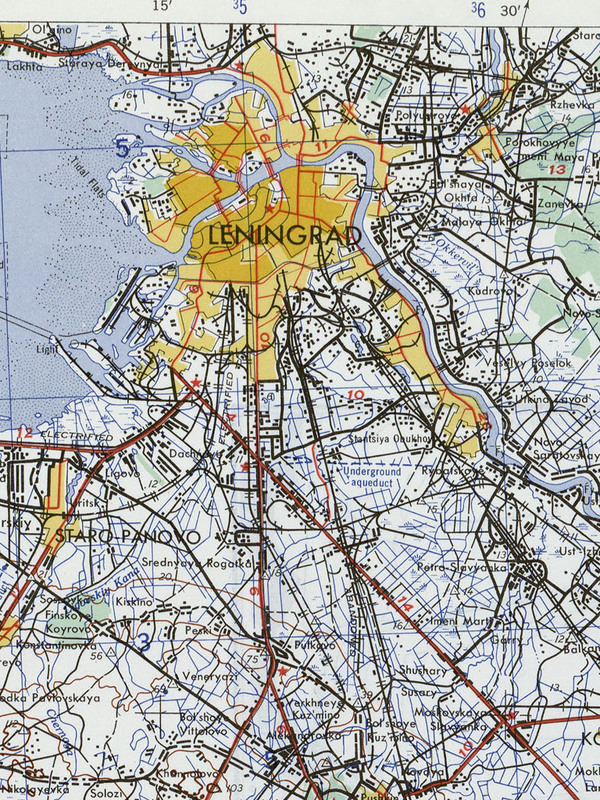 Map of Leningrad city and its surroundings from the University of Texas' Perry-Castañeda Map Collection. We were working near the rail line running east-west to the north of the city, near the north edge of this map.